Will work on your iPad, iPhone AND Mac computer – buy it once, use it on all your Apple devices! New iPad Interactive edition featuring over 90 minutes of audio, 22 minutes of video and more than 100 quizzes, full colour graphics, hand examples and 4 full readings with explanations spanning over 100 pages. This book has been rewritten from the ground up exclusively for iPad and now includes everything you need to learn palmistry from the get go! Unlike most palmistry books that talk very little about giving readings, Palmistry – Palm Reading In Your Own Words iPad Interactive Edition focuses on the realities of giving a palm reading to another person. Using a ten-step flash card system that is fun to learn and easy to remember, Julian Moore shows you how to construct a palm reading from start to finish and teaches you how to give readings that are personal, informative and fun. Unlike many other cold reading books that force you to learn stock phrases this book helps you memorise the palmistry lines and meanings in simple terms, but teaches you how to expand on these concepts and ideas in your own words. By encouraging you to find your own voice and helping you develop your skills as a communicator, this book shows you how to give real readings that connect with people. Finally the iPad / iOS edition of my palmistry book is complete and it’s been quite the ordeal. As I tidy up my files and look over all the resources, graphics, audio and video I’ve had to compile and create for this new interactive edition I’ve been taking a look back at the origins of the book to see just how far it has come. You can buy the book here. Unlike most palmistry books that talk very little about giving readings, Palmistry In Your Own Words focuses on the realities of giving a palm reading to another person. Using a ten-step flash card system that is fun to learn and easy to remember, Julian Moore shows you how to construct a palm reading from start to finish and teaches you how to give readings that are personal, informative and fun. The flash cards correspond with each chapter and are available to download as a PDF file once you register your copy of the book. You can print them onto index cards to keep in your back pocket for learning on the go, or upload them to your phone and swipe through them whenever you like – great for last minute revision before giving a real-life palm reading! With the book, flash cards and audiobook you’ll be learning from all angles. With the graphology analysis system outlined in this book designed to be learned in few days, you can be giving interesting handwriting readings in no time at all – people will think you’re a handwriting analysis expert! No need for last minutes nerves – a quick look at your flash cards and you can top-up your new found knowledge in no time. Having the graphology meanings on flash cards makes studying much easier and you can quiz yourself on the go. Comes with a 47 PART AUDIOBOOK download – making learning even easier! Cartomancy – Fortune Telling With Playing Cards is one of our best-selling books and for good reason; once you start giving playing card readings everybody wants one! Giving readings with playing cards is extremely common, but it’s amazing how few people know how to give a good reading using a normal pack of playing cards. We all know that hearts means love and diamonds means wealth, but what about the scary suit of swords and what on earth do clubs signify? In this book, jam packed with examples, you’ll learn how the suits interact with each other in ways you’d never even considered and learn how the numbers and face cards combine to allow you to give fun, informative readings with cards within only a few hours of study. This isn’t just any old guide book – it’s a complete rundown of how to structure a reading and how to look at the suits and numbers in a different light. In this book, Julian Moore brings together the ideas from the past and brings them right up to date with a fun, easy to remember system using an ancient divination technique known as the Lo-Shu Square that combines not only a person’s birth date but also their lucky numbers and their most personal number of all; their mobile phone number! Not only that you get Julian’s unique ‘story’ take on the numbers one thru ten, allowing you to visualise the meaning of each number in the context of a narrative you’d be hard-pressed to forget! If you’re fed up being vague about star sign dates and meanings instead of looking truly knowledgable then this book can help you learn this information once and for all. Never be caught out on a horoscope again! 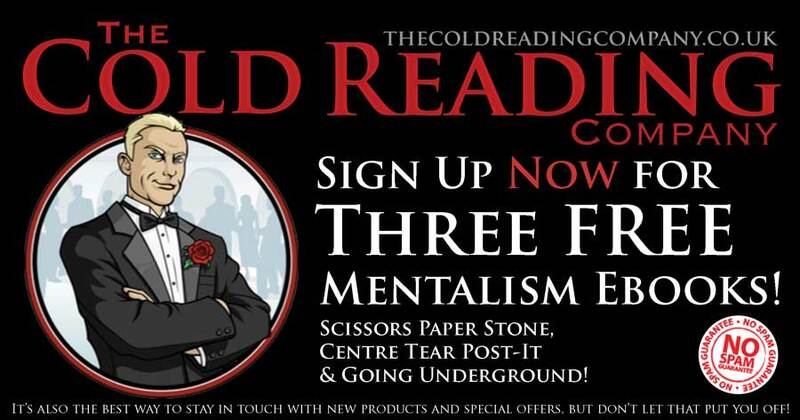 If you’ve seen mind readers on the TV such as the mentalist Derren Brown, you may well have seen them using cold reading techniques. By using Barnum Statements taken straight from the Forer Experiment of the 1950’s, performers such as Derren can appear to know as much about a person they’ve only just met as someone who’s known them a lifetime. By bringing a modern slant to an old technique, Julian Moore proves once again that that the old ones are the best – if only we knew how to apply them. If you’re not a fan of ‘stock lines’ this book could seriously change your mind! 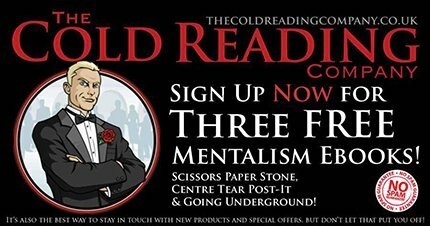 So forget about learning stock lines and never using them – using the proven methods in The James Bond Cold Reading, you can learn to speak in you own words and amaze people by how much you know about them using one of the most overlooked tools of mentalism in a way that no one would ever suspect.